Crown Prince Mohammed bin Salman, 32, is the new face of the kingdom, a combination of retail political skills, ruthless autocracy and a youthful drive toward modernity tempered with the religious piety no Saudi leader could survive without. Crown Prince Mohammed bin Salman, the heir to the Saudi Arabian throne, comes to the U.S. on a mission. Mohammed, 32, is the new face of the kingdom, a combination of retail political skills, ruthless autocracy and a youthful drive toward modernity tempered with the religious piety no Saudi leader could survive without. 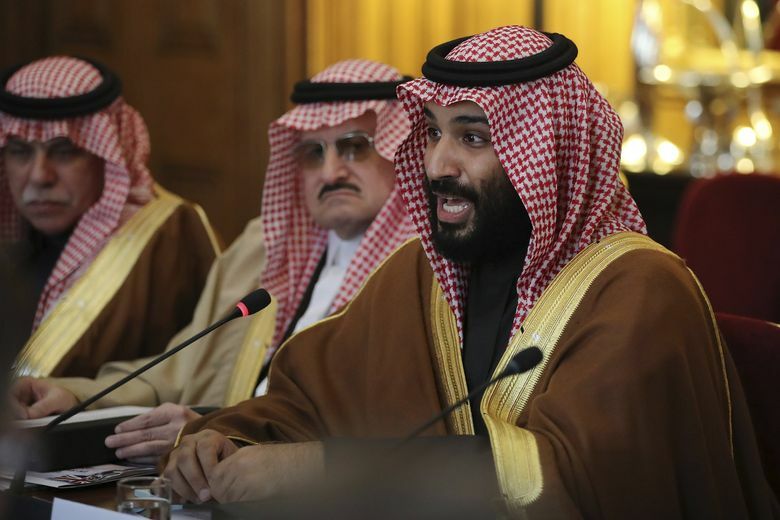 Less than a year into his reign, he has moved quickly to remove internal rivals and transform the conservative Saudi culture, diversify the country’s economy and consolidate its power and his own as the leader of the Arab world. After meetings with the Trump administration, he will embark on a two-week, coast-to-coast tour of U.S. business and technology centers, hoping to woo new investment and convince Americans that he and his country are modern, worthy partners. Here's a roundup of stories about the crown prince and his U.S. visit. Some of those tasks are likely to be easier than others. President Donald Trump, who visited the kingdom last spring, has been effusive in his praise of King Salman, lauding their shared efforts against terrorism and antipathy toward Iran as well as massive Saudi purchases of U.S. military equipment. Although Defense Secretary Jim Mattis and outgoing Secretary of State Rex Tillerson made multiple visits to Saudi Arabia last year, and Trump has spoken regularly by phone with Salman and his son, Mohammed is said to have particularly close relations with Jared Kushner, Trump’s son-in-law and a White House adviser. Kushner, who visited Mohammed last fall in Riyadh, the Saudi capital, will have a private dinner with him during his four-day stay here, according to an administration official. But U.S.-Saudi ties are not without strains. Among other things, the administration would like to see an end to an ongoing boycott by Saudi Arabia, the United Arab Emirates and others of neighboring Qatar, whose Al Udeid Air Base is the operations hub for the U.S. campaign against the Islamic State and hosts the regional headquarters of the U.S. Central Command. Trump, who will host the rulers of the U.A.E. and Qatar separately after Mohammed’s departure, hopes to persuade the three to return in May for a summit with him to settle their differences. “Certainly, we want to see it fixed,” said retired Gen. Anthony Zinni, a former Centcom commander who traveled to the region on the administration’s behalf this month to push for a solution. “That message comes out loud and clear,” including, he said, from Trump, who initially backed the Saudi move against Qatar. The administration provides military and intelligence assistance to a Saudi-led coalition fighting a brutal war in Yemen. The White House would like for the conflict to be brought to a negotiated end but is not considering withdrawing its support, according to U.S. officials. While Trump and Mohammed, who is Saudi Arabia’s defense minister, consider the war a struggle against Iran, many U.S. lawmakers see it as a U.S.-aided humanitarian disaster. Mohammed’s aggressive approach toward Qatar and Yemen – and a bizarre episode in November when the Saudis briefly detained Lebanon’s prime minister – have raised concerns among U.S. officials about the crown prince’s reliability and judgment. Kushner’s hopes that Saudi Arabia will facilitate his plan to forge an Israeli-Palestinian peace have dimmed since Trump’s recognition of Jerusalem as the Israeli capital, something senior Arab officials across the region have indicated they cannot accept. A senior Saudi official, speaking in advance of Mohammed’s visit, emphasized that Saudi policy remains rooted in a 2002 initiative in which Riyadh and other Arab states said they would normalize relations with Israel in exchange for an independent Palestinian state with East Jerusalem as its capital. Referring to reports that the Saudis have pressured the Palestinians to accept onerous conditions to placate the administration or shore up a regional coalition against Iran, the official said that “any suggestion that we have linked our position on Palestine to other regional issues is false.” Saudi and Trump administration officials spoke on the condition of anonymity to discuss the visit in advance. Counterterrorism, defense, the oil trade, and stemming Iranian influence in the region form the basis of U.S.-Saudi ties, but Riyadh, under Mohammed, has worked to expand its relationships as he moves the kingdom toward Vision 2030, his economic and social modernization plan. China has replaced the United States as Saudi Arabia’s main export market. While U.S. imports of oil, the main Saudi product, have decreased as American domestic production has gone up, the Saudis still hold a trade surplus with the United States. The aging King Salman, who rarely travels outside the kingdom on official business, visited China and Russia last year, signing economic, security and nuclear energy deals, including a Saudi letter of intent to purchase a Russian antimissile defense system. China and Russia are contending for contracts to build planned new Saudi nuclear power plants. U.S. companies would like a major piece of that business, along with placement on the New York Stock Exchange of a planned $100 billion initial public offering by Aramco, the Saudi oil giant. Both efforts are problematic for the United States, however, in ways that don’t concern Russia and China. Saudi Arabia would like nuclear enrichment capability as part of the power deal – something that U.S. civil-nuclear arrangements generally prohibit. Mohammed said in a “60 Minutes” interview broadcast on the eve of his arrival that his country will build a nuclear weapon if Iran does. At the same time, some believe that Aramco’s entry on the New York exchange could leave the company liable for legal claims by victims’ families and survivors of the Sept. 11, 2001, terrorist attacks, who allege Saudi complicity. Many of the U.S. business and high-tech investors Mohammed hopes to entice to the kingdom are concerned that his rush to power poses risks to foreign investment there. In November, Saudi authorities arrested hundreds of people in what they called an “anti-corruption” sweep, including princes, business tycoons and cabinet ministers. On the surface, the campaign seemed intended to tackle the kingdom’s well-documented struggles with graft. At home, Mohammed has generated excitement, particularly among the under-30s who make up nearly two-thirds of the population, by easing some restrictions on culture and entertainment and reining in the authority of the so-called “religious police” who enforced the kingdoms’s ultraconservative norms. Concerts have been held, and movie theaters are set to open later this month. For the first time this summer, women will be allowed to drive cars, attend some sporting events and, under certain conditions, join the military, although they still require the permission of a male guardian for many decisions, including to travel abroad. There are several reasons for Mohammed’s rush to modernity. With oil prices low and unlikely to provide the endless wealth on which the Saudi royal family once depended, “if there are no changes, the kingdom is headed toward disaster,” said Bernard Haykel, a professor of Near Eastern studies at Princeton and frequent visitor to Saudi Arabia who has spent time with the crown prince. The crown prince also has a short bench of trusted talent. Partnerships with outsiders, better training for those at home, and openings to women are in part inspired by the need to build a new class of Saudi leaders. But Saudi Arabia remains an absolute monarchy, and the loosening of social restrictions has not been accompanied by any sign of increased tolerance for opposing political views. Indeed, the number of topics likely to draw the government’s ire – including any critical commentary on the military intervention in Yemen or the feud with Qatar – has only grown. A crackdown on dissent began soon after Mohammed was named crown prince last summer. It has targeted rivals within the royal family and popular clerics as well as bloggers and activists, according to rights workers. Saudi authorities have kept silent or referred only obliquely to a spate of arrests beginning in mid-September that, according to a report released in January by the New York-based Human Rights Watch, swept up dozens of dissidents, clerics and writers Among those detained was Salman al-Awda, a popular cleric who was detained for months without being questioned or charged, the report said. A relative told the group that Awda was detained for refusing to tweet in support of the Saudi-led blockade of Qatar.